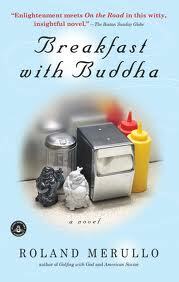 a book chick: "Breakfast with Buddha"
my take: I really liked this. I laughed, I cried, I came away a better person. This novel puts you in the backseat on a wacky road trip from New Jersey to North Dakota with a middle-aged man and a world-famous holy man. Along the way the big questions get asked and answered: Why are we here? Why does evil exist? What are the roles of pleasure and pain? ... And lots of meals are devoured. A great blend of the philosophical and the physical. One of my favorite sentences, and this may show my (middle) age:"The delusion of youth was that you believed you'd never reach middle age, and the delusion of middle age made you believe you could go on more or less indefinitely the way things were." Ha! blew my theory that I WON'T GET OLD. I could easily re-read this to get even more out of it. Fun plot with lots to discuss/ think about.